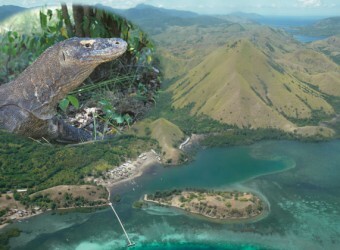 Bali Activity Komodo National Park is about 1.5 hours by small jet. You will land into Flores Island and go to Komodo Island by boat. The largest lizard in the world, Komodo dragons which becomes maximum 2-3 m and 70-90 km lives in the island and are famous as carnivorous animals which sometimes eat each other! The overnight tour to meet komodo dragons and visit a famous pink beach starts from Bali! ※Children age under 6 cannot join the tour. ※For make booking, you need Pass port name and number for all persons. Please let us know when you booking. ・Fuel Charge might be happened. ◆ This tour is for people over age 6, healthy and exercise without problem. ◆ The returning day is not available for the tour. ◆ The schedule might be changed to the tour might be cancelled due to the weather or other condition. ◆ The payment has to be done by bank transfer to our Japanese account by JPN￥ 2 weeks before the departure. ◆ Any change, cancel and refund are not accepted after the transfer completed. Passport(Please bring as ID), Sunblock, Insect Spray, Camera, Hat, Raincoat, Long Sleeve Shirts and Pants, Sneakers, Flip Flops, Necessary Medicine ※You can not check in your luggage. A messenger bag or backpack is useful to carry all your staffs. * Bring flip flops if you want to walk on the pink beach. * Komodo Island is registered as World Heritage. It is not accepted to take any items such as sand of the beach, seashells and stones from the island. * Bring anti-travel sickness medicine if necessary. * Children are required to join the tour with adults. Also The returning day is not available for the tour. ・Visiting the beach might be impossible due to the ocean current. ※The schedule might be changed or the tour might be cancelled due to the weather or other conditions. *2 Your clothes may wet while transferring by speed boat. You had better weat swim suit or bring clothes for change. *3 Due to condition of ocean, if a guide decide not available, snorkeling is cancelled. The refund is not available for cancellation. ※Price, Schedule might change wihout notice. I’ve ever seen Komodo dragon only on TV. It was great to see it directly. During daytime it is quiet because hiding in the shade. I wanted to touch it but I stopped because it was likely to be bitten.